Brand building is vital for any business, no matter how big or small. Strong brands stand out in every market, attract more customers, and keep more of those they already have. The value of brand building is often misunderstood, especially amongst small businesses who are used to associating time and money with a specific, tangible outcome. A new logo or strapline is not rebranding your business. A strong brand dictates the way your business operates, and how it addresses your customers. Without that depth, customers will see through the superficiality of the process and you will see no positive return or uplift. In fact, you will probably end up losing the brand equity you currently have. Because we need to justify marketing costs, there are countless brand metrics agencies will use to measure the value of a brand. The fact that there is no one definitive answer shows how difficult branding is to quantify. Most companies can’t afford to hire an agency to do this in-depth brand analysis any way, but there is a quick way you can determine how strong your brand is yourself. No research, no data, no graphs and no fancy pie charts at jaunty angles. Just you, your brain, a pen and some paper. If your brand was a commercial airline, what would it look like? You will get better results if you are brutally honest with yourself at each stage. How easy did you find that to do? If you instantly had a clear picture of every element of an airline applying your brand, then you have a very strong brand position and statement of purpose. If you could think of some of the elements, but had to force a few others or were unsure, then you are making progress but your brand needs to be better defined. If you sat there unsure of any of it, or it being a real jumble of ideas, then that is probably how people see your brand. To illustrate my point, think of some of the world’s top brands and apply the same idea. Without fail, the type of airline they would be is clear and obvious. Let’s have a go at applying this to the world’s most valuable brand; Apple. You know an Apple airline would use beautifully crafted aeroplanes with very comfortable seating, and customisation of the experience at each stage available via connected devices. They would instantly know who you are and your preferences based on the data stored on your iPhone/iPad/iPod. The service would be relatively informal, with as much emphasis on helping yourself as much as possible. The in-flight entertainment would be heavily focused on consuming the content on your Apple device, connecting people on the plane to play games. The food would be presented in such a way that it felt original. That all came very easily. You can’t know where you need to go, without understanding where you are and what the road ahead looks like. The first step is to gather feedback from your customers and employees about what they think about you, including what they like and what they dislike. Marketing assets e.g. website, brochures, emails etc. Combine qualitative (e.g. focus group, interviews…) and quantitative (e.g. survey) methodologies to build a picture of your current strengths and weaknesses, as well as opportunities to move your brand towards. 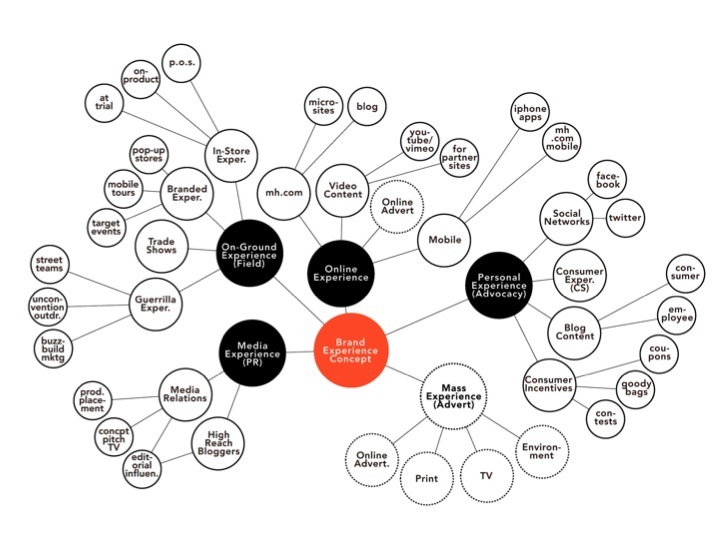 As well as looking internally, you should map what your marketplace looks like. 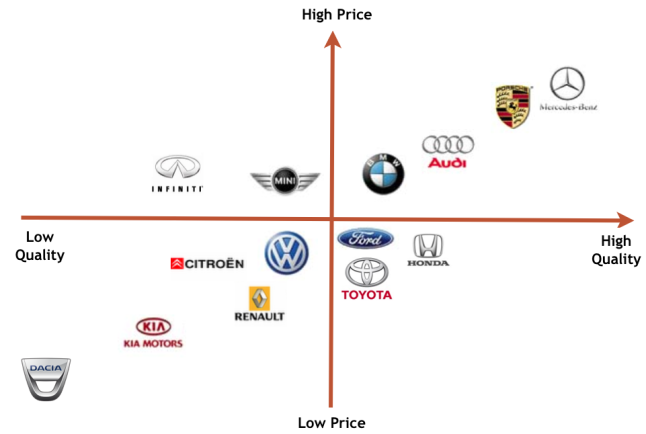 This includes both the market’s customer segments, and where you and your competitors fit on a perception map (with each axis representing two key factors that matter to your customers). With this data you can identify the segments you want to appeal to, as well as how successfully you are currently doing this. Research what matters to these customers. Is it value for money, reliability, security, personal service…? You can these align your new brand around these principles. For example, how can you help support your customers’ micro-moments? The best and most successful re-branding projects are usually wrapped in a positive story for customers and staff to get behind. A fresh new look isn’t a story to lead with. The story should be one that benefits your customers, and runs deeper than a new graphic. Make sure you know what are you looking to achieve , and then do everything you can to ensure your internal and external stakeholders understand it as well. Does your brand fail to resonate with your target audience, are you facing increased competition and you want to stand out in a crowded market place, have you started to look old-fashioned in an industry where image matters, are you consolidating multiple sub-brands into a simpler structure..? Create a mission statement supported by SMART objectives to gauge success, and keep everyone focused on what you want to achieve. Mission: To always put our customers first. No matter what you decide, it is important that you can deliver on any brand promise. I would strongly recommend using a professional designer to update your brand’s look and feel. Marketplaces such as fiverr.com will connect you with professional designers who can create collateral, including a new logo. Test your new brand proposal and the basic design aesthetics before you commit to a new brand. Get feedback from a focus group that represents your target audience. Do they express what your brand stands for accurately unprompted? Your most important asset are your customers. You must be clear why these changes are happening, and why it benefits them. Give them the chance to ask you questions and get involved. 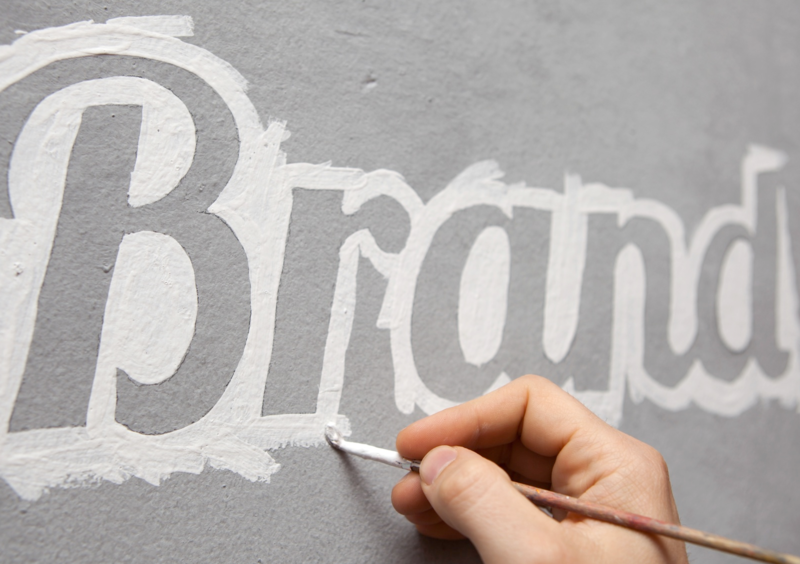 There are three general approaches to rebranding your business. Whichever approach you decide to take, a good brand building project will tick four boxes. Although the ultimate aim of any B2C marketing is to increase sale at some level, direct sales and price promotions are not the only way of doing this. If a customer has not heard of you, how can they buy from you? This is where campaigns with awareness objectives come in. Brand awareness campaigns can involve mass media channels such as print, TV, radio, and online at a national or local level depending on your budget and audience. However, although each of these channels has its own reporting metrics, how successful your campaign has been as a whole in raising awareness of your brand can be difficult and expensive. Brand tracking surveys (covering awareness, perception and intent) are really the preserve of large businesses, as they are expensive to run. 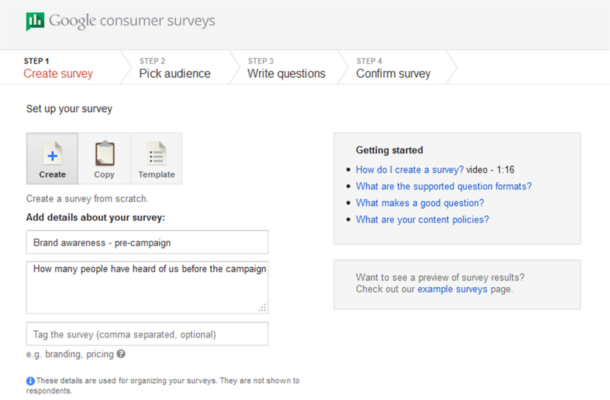 One great alternative is to use Google’s Consumer Surveys service. This is a great way to set up a survey amongst a sample that statistically represents the UK population. Plus it only costs approx. £60 to survey a sample of 1,000 people, which is statistically valid enough to apply the findings to the entire UK population. You can use this service to run a survey before you campaign asking “Which of the following companies have you heard of?” listing your own and your direct competitors. 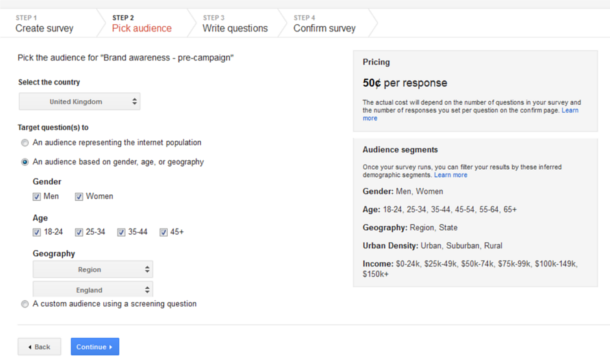 After your brand campaign has finished, run the survey again and track the changes in awareness. Step 2: Pick your audience. You can choose who you want to take part in the survey based on your target audience. If your customers are women based in Yorkshire, there is no point in doing a UK national survey both men and women can take part in. Step 3: Write your question. There are a number of question formats to choose from here. Because you want to know all the brands a person has heard of, I would choose “Multiple answers”. Enter the questions and answers you desire. You will then be asked how many responses you want. 500 is enough for local surveys, and I would recommend 1,000 if you want a national one. Once you have completed your order, the survey will be checked and if it is approved you will start seeing the data in your account very quickly. From experience it typically takes a week or two to get 1,000 responses. Once your brand campaign is complete, run the same survey with the same set up and you should be able to see what impact you have had. – Rebranding a small company is a must in certain situations, but it’s sometimes really hard when the owner feels somehow attached to her original plan. – According to my experience, there’s always a reason when it comes to rebrand a small company, and that’s usually a lack of a story. A one that gives the brand what it needs to be different and remarkable. Great point on needing a story to make yourself different and remarkable.